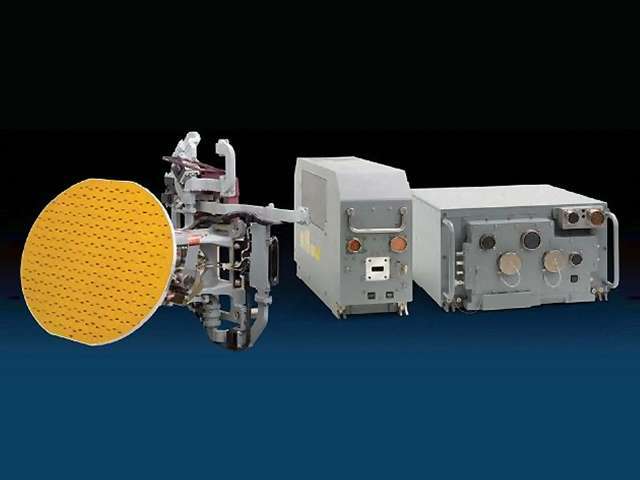 The AN/APG-67 is an operating in X-Band multi-mode all-digital coherent pulse doppler radar, that was designed and developed by General Electric explicitly for Northrop's F-20 Tigershark in the late 1970s. It uses a planar phased array antenna and a low peak power Traveling Wave Tube Amplifier (TWTA) in the transmitter with low pulse repetition frequency (PRF) in the look up mode, medium PRF in the look down mode, and high PRF for velocity search. The signal processor is fitted with CMOS large scale integrated circuits. I features pulse compression and digital Fast Fourier Transform processing. The AN/APG-67 offers a variety of air-to-air, air-to-ground, sea-search and mapping modes, and compatibility with most weapons used by the US Air Force in the 1980s. Its search range for fighters is about 130 km, the tracking range is about 90 km. The SAR mode is an optional add-on to the basic system. Lockheed Martin produces the AN/APG-67(V)4 at its facility in Syracuse, N.Y. The AN/APG-67 is used in the Taiwan Indigenous Defense Fighter aircraft Ching Kuo, and in the T/A-50 aircraft, which uses the Republic of Korea Air Force.